By the time you read this, I am probably on the road to Indiana for my buddy's wedding. If anything is wrong with the update, well, I won't know until I get back! Will shade the page later. 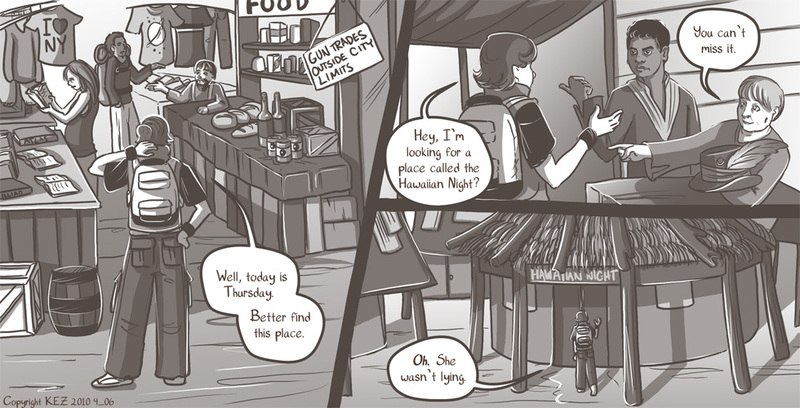 In today's page, we have 2 cameos of people who elected not to be slain horribly! Peg Fisher is holding one of her hats that she designs and sells at her Etsy store! She is accompanied by Tamoso, her grandson of choice. Yes, yes, you do NOT have to die if you a member of Colbey's Red Shirt Squad. You can sign up for that here, I made it so guests can post. If you are going to sign up, please post a pic/pics that include more than just your face, eh? Lastly, are you a Stumble Upon user? Do you enjoy this comic? Pass a stumble my way, please!